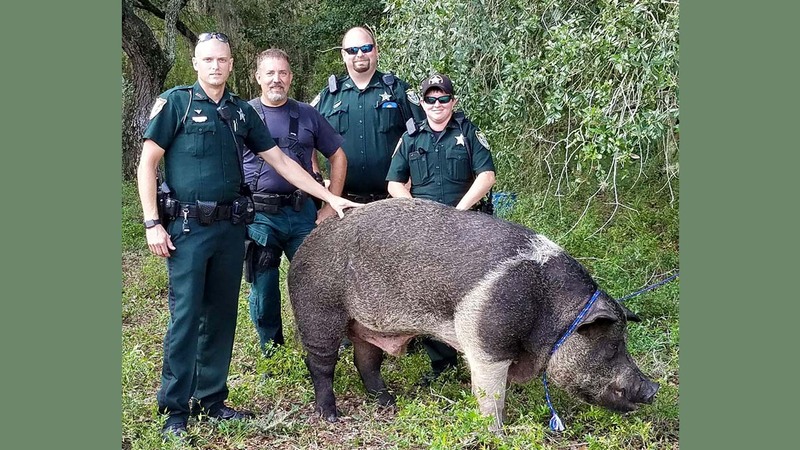 GAINESVILLE, FL -- Deputies in Florida are searching for the owner of a 600-pound hog that was found roaming around. Local news organizations report that Alachua County deputies found the domestic hog Sunday after getting reports of the animal running at large. Deputies caught the hog using a rope and took it to the Alachua County Sheriff's Office Livestock Impound. The sheriff's office said in a news release that the 600-pound Hampshire hog appeared to be in good health. The animal will be put up for auction if its owner doesn't claim it. Anyone with additional information is asked to contact officials.